… Being constantly and consistently harassed. Nagging isn’t just word choice (though that’s pretty significant) it’s also about tone of voice, body language, and perceived attitude of the nagger. We’ve all had an experience of being nagged at some point in our lives, right? There has been at lease one person that has constantly harassed us to do something. Mom was all about, “Eat your vegetables, clean your room, wash your hands.” Am I right? We got the message that caring means constant reminders to do certain things. We got so used to being nagged as a kid that it almost became white noise. And then when we became adults, it was still there, programed in to our every day relational interactions. When we were kids our parents nagged us to help us grow in to healthy, productive, respectful adults. But we learned that nagging was acceptable. But here’s the deal, nagging is disrespectful, controlling, and it most often stems from fear. How does this all start? I mean, you weren’t born a nagger were you? Was it learned behavior? Let’s face it, we’ve all nagged someone, right!? Whether you meant to nag or you meant to motivate it all starts somewhere. You ask, you request, you ask again. But it doesn’t get done! Then the fear kicks in. And you start nagging. For many of my clients the nagging cycles starts with a request. It could be as simple as a request for a spouse to put down the cell phone, or to help clean the kitchen, or turn your laundry right side out. For whatever reason this request is left repeatedly unfulfilled or ignored. There could be many reasons why a request is ignored, too. Don’t misunderstand, there could be legitimate reasons why something isn’t being done when asked. Once you’ve made the request a time or two and have been ignored, either intentionally or not, you turn to “reminding” your partner. I’m sure you’ve heard the phrase, “I”m not a nagger, I’m a motivational speaker.” Helpful reminders aren’t really helpful if the tone is more nag and less about being helpful. Nagging is a toxic and disrespectful form of communication that is a direct reaction (not response) to FEAR!!! Fear drives you to control every situation so you don’t have to feel anxious or so that you don’t have to be disappointed. Now that this cycle has begun and it’s in full swing it leads to being ignored and withholding (physically or emotionally). This leads to more nagging until both people feel increasingly annoyed, unheard, and disconnected. Not only is it exhausting and destructive, it doesn’t work, does it??? No one in the history of ever has come in to a session with me extolling the virtues of nagging their partner. Nagging can very often result in disconnect, disharmony, no emotional or physical intimacy, disrespectful communication, arguments, and eventual toxic patterns. Consider healthier ways of communicating your needs to your partner. 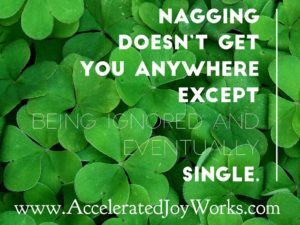 How Do You Break the Nagging Cycle? Relationship coaching can help you break the cycle. When you meet with a coach together you can work towards unearthing the path you took to the behavior and can help you create a brand new pathway to getting your needs met through healthy communication. Book a session with Tiffany to help you create a healthy and brand new pathway to a harmonious relationship. JoyWork Suggestion: From the list above select one to two options to implement for a week or more and see how you are fairing. Let me know how you’re doing on the Accelerated JoyWorks Facebook page or in the comments below. This entry was posted in Communication, Nagging, Toxic Relationships and tagged Communication, Nagging, Verbal Abuse, What do men want. Bookmark the permalink.